To Cape Canaveral… and beyond! I’ve always been a space geek. Therefore, I’ve always wanted to go to the Kennedy Space Center. There’s a museum there and a bus tour you can go on. The tour stops five miles away from the launch area and while you can’t go into any buildings, the activities within are explained to you. I fulfilled a fantasy this week. Not only did I go to Cape Canerval but I managed to get an “access all areas” look around the place. It’s all thanks to an engineer called Benny who listens to Paul Boag’s podcast. In a startling revelation, it turns out that Paul’s listeners are in fact rocket scientists. The NASA “friends and family” day just happened to fall right at the end of Refresh Orlando. Benny invited Paul along. Andy and myself invited ourselves along. As it turned out, there hadn’t been one of these open days since 2001. We were very, very fortunate and privileged to be allowed behind the scenes at NASA. 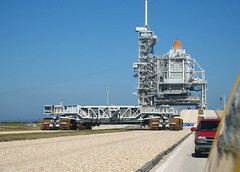 In contrast to the regular tour, we drove right up to the launch pads, including launch pad B, which had Discovery rolled out and ready for launch on December 7th. We also got to go inside the Vehicle Assembly Building, something that is normally not allowed. It’s incredibly huge. I mean this is seriously big. Imagine a really big building and then imagine it being bigger. Best of all, we went inside the orbiter hanger. Endeavour was inside. A space shuttle… a freakin’ space shuttle! That was just so incredibly cool, I can’t even begin to describe it. I hope I’m not coming across as gloating here: I really just want to share my excitement. It was quite an experience to get so close to the ultimate geek toys. The only way it could have been any better was if Jessica could have been there. Soulmate that she is, I think she might be an even bigger space geek than me. Clearly, my descriptive powers aren’t up to the task of cataloguing the day’s sights, so I’ll just point you to this photoset on Flickr.